Ford Performance, the high performance division of Ford Motor Company, has additively manufactured what its claims “the largest 3D metal-printed part for a working vehicle in automotive history.” The aluminium manifold inlet, 3D printed on a Concept Laser X LINE 2000R from GE Additive, took five days to complete. Neither Ford nor Hoonigan have revealed the actual dimensions of the manifold, except to say that it is 6 kg in weight. This makes more than twice as heavy as Bugatti’s 3D printed brake caliper, itself at the time claimed to be “the largest functional component” 3D printed out of titanium. The Bugatti brake caliper measured at 41 x 21 x 13.6 cm (L x W x H). Ford’s inlet manifold was created at Ford’s German 3D printing lab, with the help of RWTH Aachen’s Digital Additive Production Institut, from Aachen University in Germany. A 3D printed intake manifold for the Ford F-150 pickup truck. Photo via Ford. Manifolds are the part of an engine that supplies the fuel/air mixture to the cylinders. In order to supply sufficient air from the truck’s turbochargers to its cylinders, the manifold was 3D printed into a webbed structure, using aluminium alloy powder. “The manifold has a complex web‑like structure that couldn’t be made using traditional manufacturing methods. We ended up dissolving the support systems in acid,” said Raphael Koch, a materials and process engineer at Ford Europe. The vehicle is a 1977 Ford F-150, converted into a custom 900 horsepower (hp) drift truck called the Hoonitruck. It was built by Ken Block in 2014, after two years of development. Block is a professional rally driver with Hoonigan Racing Division, a motor racing team that competes in world championships. He is also one of the co-founders of DC Shoes. Block built the Hoonitruck as a tribute to his late father, and for nostalgic reasons – the F-150 was the pickup he learned to drive in. He was looking to feature the truck in his next Gymkhana video, a popular racing YouTube video series. The most recent episode has 13 million views to date. The intake manifold is an important and complicated part of a car, particularly a racing vehicle. Conventional manufacturing has design limitations, such as uneven air distribution and other engine performance problems. Furthermore, there are many small components involved in putting together an intake manifold. Last year, Hornet Racing, a racing team from California, decided to overhaul the design for their 2017 race car, using an additively manufactured manifold. The team used the Digital Light Synthesis (DLS) technique from Carbon 3D, a Californian 3D printer manufacturer. Previously, manifolds and similar parts have been 3D printed as plastic prototypes, to test how well the finished product will fit into the vehicle. These models can then be used to cast a metal part. 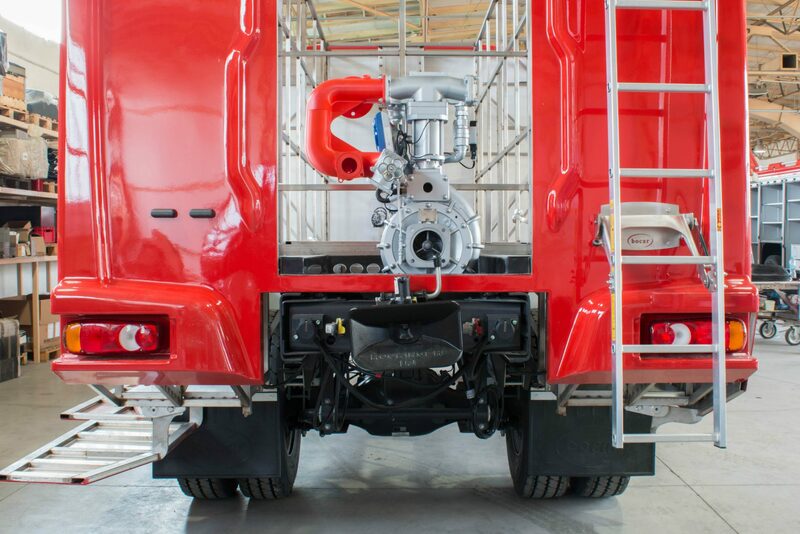 In one such project, Bocar, a Polish fire engine manufacturer, 3D printed a vacuum manifold prototype for a fire truck engine, using ABS. This is the second of Ford’s recent updates on the subject of trucks. Last March, the company announced that it would be investing $25 million into its Ford Trucks plant in Kentucky, with plans to purchase a second 3D printer. Meanwhile, Daimler Trucks North America, an Oregon heavy duty vehicle manufacturer, is considering increased manufacture of 3D printed spare parts. The company began creating rare and spare parts on demand in 2017, aided by 3D printing service bureau, Technology House. Metal spare parts for vehicles are necessary for owners of original or restored vehicles, such as the 1977 Hoonitruck. These need replacement parts to keep them running, and additive manufacturing allows manufacturers to simultaneously upgrade these parts. Nominate Ford or another automotive company in the upcoming 3D Printing Industry Awards 2019. We have many more updates on automotive and additive manufacturing. Subscribe to our 3D Printing Industry newsletter, for more, follow us on Twitter and like us on Facebook. Or, perhaps you’re interested in a career in 3D printing yourself. Visit 3D Printing Jobs to begin a new job in additive manufacturing. Featured image shows the 1977 Ford F-150 Hoonigan. Photo via Hoonigan.